Oh man, where are Ron, and Harry when you need them? 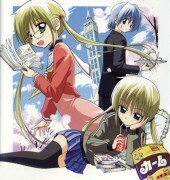 Browse Hayate the Combat Butler Gallery: Recent | Popular. Haha! This is funny~ But I don't get it.. Why are they dressed as HP character? Quote by temarigeniusHaha! This is funny~ But I don't get it.. Why are they dressed as HP character? Hermione Ayasaki is a nod to Hermione Granger. Thus, the Harry Potter gear. Cute,I like it!I like this story. Thanks for your effort very much for sharing.